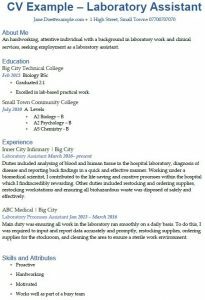 Use this CV example for Laboratory Assistant job applications. 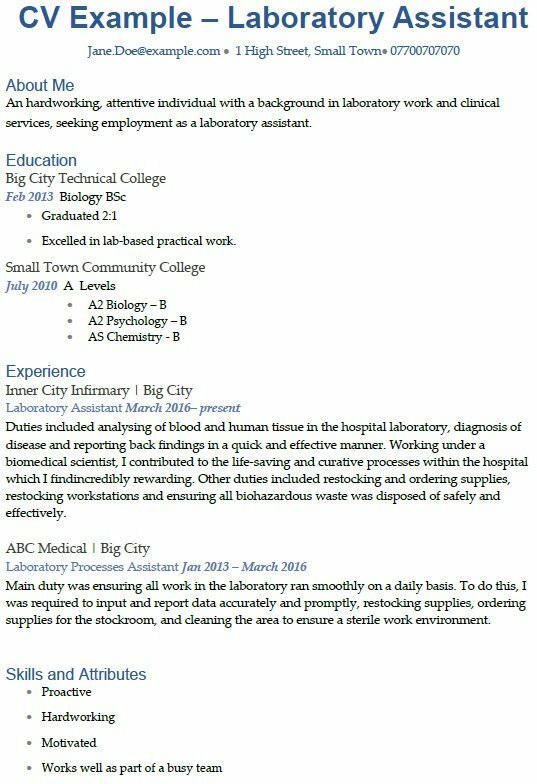 An hardworking, attentive individual with a background in laboratory work and clinical services, seeking employment as a laboratory assistant. Excelled in lab-based practical work. Duties included analysing of blood and human tissue in the hospital laboratory, diagnosis of disease and reporting back findings in a quick and effective manner. Working under a biomedical scientist, I contributed to the life-saving and curative processes within the hospital which I findincredibly rewarding. Other duties included restocking and ordering supplies, restocking workstations and ensuring all biohazardous waste was disposed of safely and effectively. Main duty was ensuring all work in the laboratory ran smoothly on a daily basis. To do this, I was required to input and report data accurately and promptly, restocking supplies, ordering supplies for the stockroom, and cleaning the area to ensure a sterile work environment.